A joint announcement on June 26, 2000 by the President of the United States and the Prime Minister of Great Britain—that a worldwide consortium of scientists had successfully mapped the entire human genome—provided a fitting tribute to what is admittedly an amazing milestone in human (and scientific!) history. When Francis Collins, M.D., Ph.D., who chairs the U.S. Government’s vast Human Genome Project, said that “we have caught the first glimpse of our own instruction book, previously known only to God,” he certainly did not overstate the case. We are in the midst of heady times indeed. What do these events mean for mankind? What are the potential benefits and/or perils associated with this type of research? What are the ethical and moral implications? Scientists are not like mountain climbers who, when asked why they are intent upon scaling a dangerous, life-threatening mountain, reply simply: “Just because it’s there.” Researchers are not interested in mapping and sequencing the human genome “just because it’s there.” Quite the contrary, in fact. These dedicated men and women—some of whom have spent almost a decade toiling in their laboratories in an attempt to unravel what Dr. Collins himself labeled one of the greatest “mysteries of human biology”—are on a search for knowledge that will be of tremendous benefit to the human race. Most scientists are not malicious, oligarchical elitists who are out for personal fame, fortune, or power. Rather, they have a genuine desire to alleviate human suffering and to make life better. Noble goals, these. But progress sometimes comes with a steep price tag. And technology—which in and of itself generally is neither good nor bad—sometimes can be used in unethical ways. Science can produce the technology. But it cannot provide the moral impetus to guide us in the use of that technology. There is nothing inherent in the scientific method that can dictate, for example, whether nuclear energy should be used to destroy cancer cells—or entire cities. Quite honestly, that is a judgment far beyond the pale of science to make. We must look to the Word of God for the knowledge that will help us know how to handle modern technology so that its use for (or on!) humans remains within the boundaries set out by our Creator, which is why I have written The Christian and Medical Ethics—to explore genetic technologies and the Christian’s response to them. 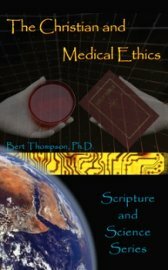 In this 60-page book, I discuss such topics as in vitro fertilization, artificial insemination, cloning, and several others of relevance in regard to current genetic research—with an eye toward the principles set forth in the Bible so that God’s people can make proper, well-reasoned, biblically informed responses when they are confronted with the blizzard of choices arising from such technologies. If you do not have a copy of this book, I believe you would enjoy reading it and would profit from it. While you are ordering, why not purchase the entire set of 8 books in our new “Scripture and Science” series? The cost is only $4.95 per book ($1.05 s/h) or $34.95 for the complete set ($2.55 s/h).